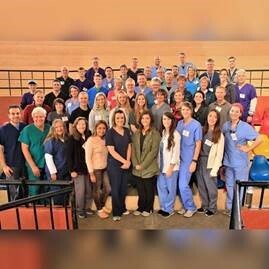 During this year's University of Louisville's School of Dentistry Spring Break, March 17th-25th, ULSD participated in a Medical/Dental Mission Trip to Ecuador. Our Dental Team was led by Dr. David Maddy, Dr. Steve Hieronymus, and Dr. Timothy Daugherty. Hundreds of people received free medical, dental and eye care during this week and the town officials were very appreciative of their efforts to help. As Dr. Daugherty stated, " It was certainly an honor and a privilege to be part of this group, watching each one of these students use their special gifts and talents to help others in need. The students worked extremely well together as a unit and represented ULSD in an outstanding manner." Both were selected for fellowship in the American College of Dentists. They were initiated at the annual ADA meeting in Atlanta that took place Wednesday, October 18th and Thursday, October 19, 2017. Read more about this prestigious honor. Alumni News - Dr. Krysta Forry Manning, Class of 2010. Dr. Manning is not your average veteran, average dentist or average mom. She has served as a captain in the Air Force, recently opened a specialized dental clinic in Anchorage and is raising triplets with her husband Ryan. The Russellville, Kentucky native has gone above and beyond for her country, her patients and her children, and to say she is one-of-a-kind doesn’t begin to cover it. Read more. Dr. Gary C. and Allyson Ball have pledged $1 million to create an endowed fund for the expansion of the school’s clinical opportunities and new technologies for student education. In recognition of their gift, the dental school has named the school’s simulation clinic in their honor. Dr. Ball also was recently selected as the school’s Alumni Fellow.Read more. The HSDA has provided oral health screenings at a local Hispanic church and for backside workers at Churchill Downs, with a goal of expanding its outreach work. Read more. 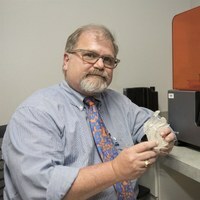 The University of Louisville is poised to become a premier center for 3D-based digital dental and medical care through the recent installation of several advanced technologies at the School of Dentistry. Read more. Dental and dental hygiene students are expanding their education by rotating to a clinic in Beverly, Ky. The initiative is a collaboration on the School of Dentistry and Red Bird Clinic, Inc. Read more and find out which alumni are helping in the effort. Dr. Pin-Chuang “Patrick” Lai, has received recognition from the American Academy of Periodontology as recipient of the 2017 Educator Award for outstanding teaching and mentoring in periodontics. Learn more.Read more perio program news. About 150 University of Louisville dental and dental hygiene students marked their entry into the profession on Aug.19 during the White Coat Ceremony at the Louisville Palace Theater. Read more about our new students. 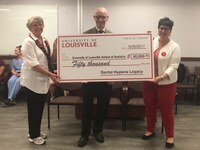 In support of student education, the Dental Hygiene Legacy committee recently presented a gift to the school. Read more. 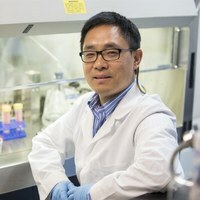 Dr. Huizhi Wang in the Department of Oral Immunology and Infectious Diseases recently earned a $2 million grant from the National Institute of Dental and Craniofacial Research to study a specific molecule involved in the body’s anti-inflammatory responses.Learn more. 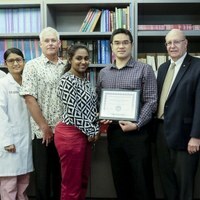 The School of Dentistry is punching above its weight in securing National Institutes of Health research grants, as we grow our research enterprise. Read more about how we’ve moved ahead.